Please enter valid age between 16-100. Please select your current insurer. Shop - Auto insurance comparison shopping made easy! Get matched instantly with up to 20 insurers in your area. Shopping made easy. We suggest choosing at least 3 companies to find one that works best for you. Comparison shopping can save you hundreds of dollars or more. The Escape SE is a compact SUV that offers plenty of bang for the buck. Optional all-wheel drive, a big cargo bay and a hands-free power lift gate make it a great family vehicle or a daily commuter. Best of all, it is very affordable to insure, slotting into second place on our least expensive to insure list, at $402 less than the national average car insurance rate. 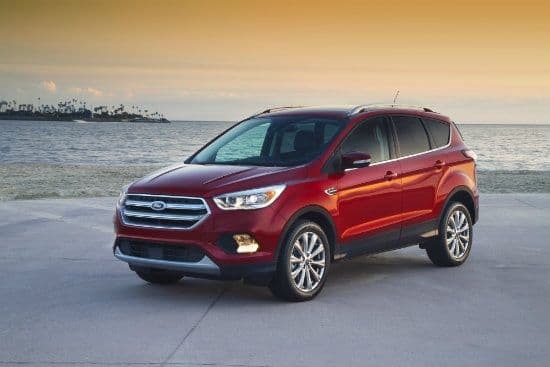 "Despite the fact that the Escape is a common target of thieves, it is loaded with safety equipment, a standard security system and is popular with families (who tend to drive more carefully) all of which make the Escape a very afford SUV to insure," says Kariotis. Age?16 - 2021 - 2425 - 3435 - 4445 - 5455 - 6465+ Age? 0 Responses to "2017 Ford Escape SE"
What do you think? You can add a helpful comment to this page by filling out the form below. Sign Up for tips & recommendation to enrich your insurance portfolio & save more! Your information is confidential. We'll never spam! Copyright © 1984-2019 Quinstreet, Inc.
Disclaimer: The insurance products on Insure.com are from companies from which QuinStreet may receive compensation. Compensation may impact where products appear on Insure.com (including the order in which they appear). QuinStreet does not include all insurance companies or all types of products available in the marketplace.